In the spring of 1876, an Englishman named David Stanton showed up in New York with two of the new machines, Keen’s Eclipse models, in tow. After a few weeks of traveling around giving demonstrations, Stanton returned to England with plenty of orders, despite the high markup for shipping and tariffs. In 1878, Albert Pope secured patents and began manufacturing the machines in Boston under the name Columbia, becoming the first mass manufacturer of high-mount bicycles in the United States. 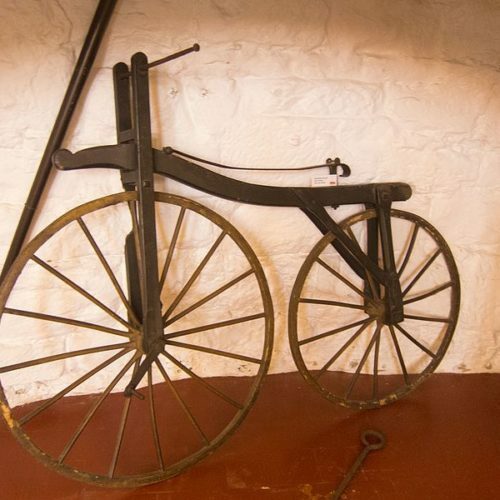 After the short-lived boneshaker craze of the 1860s, Americans had forgotten all about the bicycle. But without import costs these new, far-better bicycles became cheap enough to quickly increase in popularity in the American market. By the 1880s, the United States was experiencing its second bicycle craze. All major cities and a good many smaller ones saw the formation of bicycle clubs. These social organizations put on group rides for members as well as races and exhibitions for the delight of the public. They held road races, track races, trick-riding shows, and, as mentioned, races between cyclists and horses. Itinerant bicyclists drew crowds at arenas in cities all over the country. The bicycle, alongside horse racing and baseball, rose as mass entertainment. By 1883 most large cities had tracks for bicycle racing at their fair grounds. Newspapers reported not only the details of local races but the records and feats of cyclists from around the country. Cycling champions, such as L.D. Munger, S.G. Whittaker, and A.A. McCurdy, were household names in the way that the professional football quarterbacks are now. Women riders such as Louise Armaindo and Elsa von Blumen also made names for themselves, racing not only against each other but against male riders and horses. Cycling enthusiasts of the 1880s regarded the bicycle as more than just an amusement. In the late nineteenth century, American society had become urbanized and industrialized. The spans of the cities were becoming too wide to be walkable. The invention of mass transit in the form of streetcars offered a solution, allowing for the further expansion of the city and the building of residential suburbs farther and farther from the city center. But the bicycle, so some believed, offered a better alternative to mass transit, a means of independent travel far cheaper than the enormous expense of a horse and carriage. Besides allowing the rider to quickly traverse expanding cities, the bicycle offered a means of escaping the crowds, noise, and filth for the solace of the country. The bicycle clubs that popped up like mushrooms in nearly every city in America in the early 1880s sought not only mutual enjoyment of their hobby but to promote bicycling to the general public as practical, everyday transportation. So far, however, the general public was far from coming around to that idea. One reason was expense. At between $100 and $200—in today’s dollars, between $2500 and $5,000–the price of bicycles limited their enjoyment to the upper classes. They also, despite being much easier to handle than the old boneshakers, still required a moderate dose of athleticism to ride, and they were regarded as dangerous. “Two trains collided one dreadful day, Two trains with people filled, And for many yards around the earth Was strewn with hurt and killed. They drew one body from the wreck, So gashed twas hard to tell If in that mangled form of clay A spark of life did dwell. “How do you feel? They gently asked, When he was snug in bed. “Oh I’m all right; I don’t mind this; I’m a bicycle rider,” he said. Wheeling Register. June 13, 1886. J.J. McCarthy, Yankee Blade. collected in Louisiana Cycling Club Spokes Scrapbook. (Historic New Orleans Collection, New Orleans), 23. New York Times. August 5, 1883. Louisiana Cycling Club Spokes Scrapbook, 11.